Input-device vendor Kensington on Wednesday announced TrackballWorks, new software for customizing the behavior of the company's trackballs. The free software, which officially supports Kensington's Expert Mouse, SlimBlade Trackball, Orbit Optical Trackball, and Orbit Trackball with Scroll Ring, is the company's first new Mac trackball software in several years. The driver for the SlimBlade Trackball debuted in 2007 and was last updated a year ago; the erstwhile MouseWorks software was last updated nearly four years ago. According to Kensington, the TrackballWorks software lets you adjust cursor speed and acceleration, adjust scrolling speed and direction (on devices with scroll hardware), and customize the function of each button or combination of buttons. We've installed the software on one of our Macs, and while its functionality is similar to that of MouseWorks, TrackballWorks offers many more pre-defined options for button clicks and combinations. But perhaps its most appealing feature is improved compatibility with recent versions of Mac OS X. 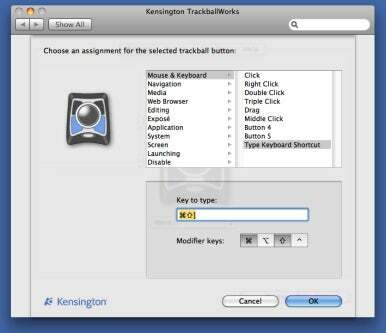 The Mac version of TrackballWorks requires Mac OS X 10.4.11 or later. Kensington has posted a video promo on YouTube.